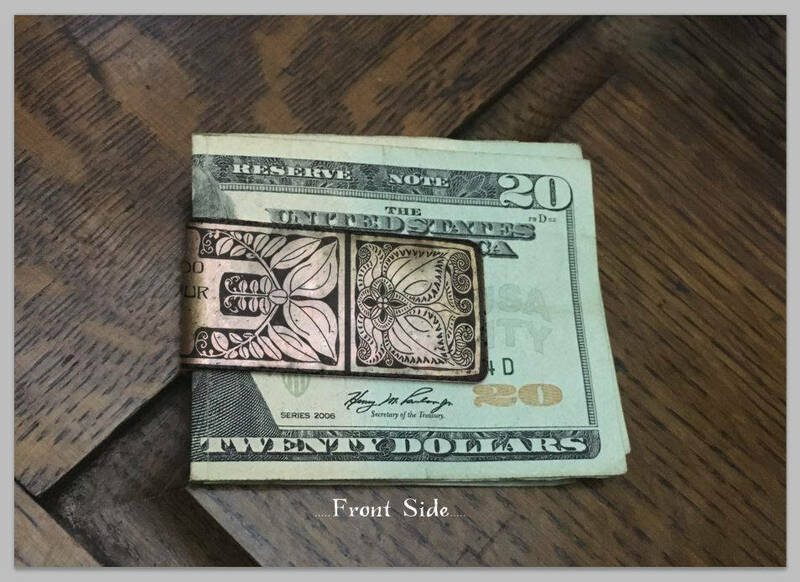 Thank you for visiting Copper Monogram Money Clip - a Copper Art Designs production. A wonderful personalized gift with an elegant way of identifying your initials, your signature or personalizing it with a special note on the back. Our ability to etch your design into copper is unique due to the intricate creation process which is all handcrafted and involves designing and hand-tooling on to the copper. Chemically etching copper is a centuries old process by which designs are positioned on a copper plate and laid in a chemical bath that slowly eats away at the metal to form designs in its surface. The Monogram Money Clip is made of heavy 18 gauge 100% recycled solid copper. Each copper piece is handmade by me and due to the unpredictable nature of our process, each piece has its own characteristics that cannot be replicated. The smooth or rough textures and subtle hues are created based on elements such as weather conditions and application of specific organic chemicals applied for various durations. The etched surfaces of a finished piece will have slight imperfections giving a rustic appearance. You may see several pinholes and lifted areas on your piece. More often than not, these “imperfections” add beauty and texture to the handcrafted finished piece. Copper Monogram Money Clip will arrive in a cloth bag, ready for gift giving! The Copper Monogram Money Clip will be lightly polished and will build a natural patina with special characteristics of age copper. The best way to prevent your Copper Monogram Money Clip from tarnishing is to use it often! *** ** * Please include in the notes to seller what you'd like to be etched in front and back. I will send you a response within 24 hours, to let you know I've received your order and to ask any design questions I may have. I will then create and send a mock-up proof of your Copper Monogram Money Clip within 1-2 days. Once you've approved the design I will proceed with your order. This item is handmade to order. The Copper etching and Patinas goes through a series of processes and it takes time. Please allow up to 7-10 working days for your item to be made and delivered to you. Your order will be completed and ready to ship within no less than 10 working days of approval. Our shop works to guarantee maximum satisfaction to service a highest quality product. Thank you for considering our handcrafted artwork. We are a small family business based out of Virginia Beach, VA. We are very proud to make each piece by hand, with much passion and love. If you have questions or need assistance with placing an order or if order is to be picked up locally at our studio, contact me via convo on Etsy. 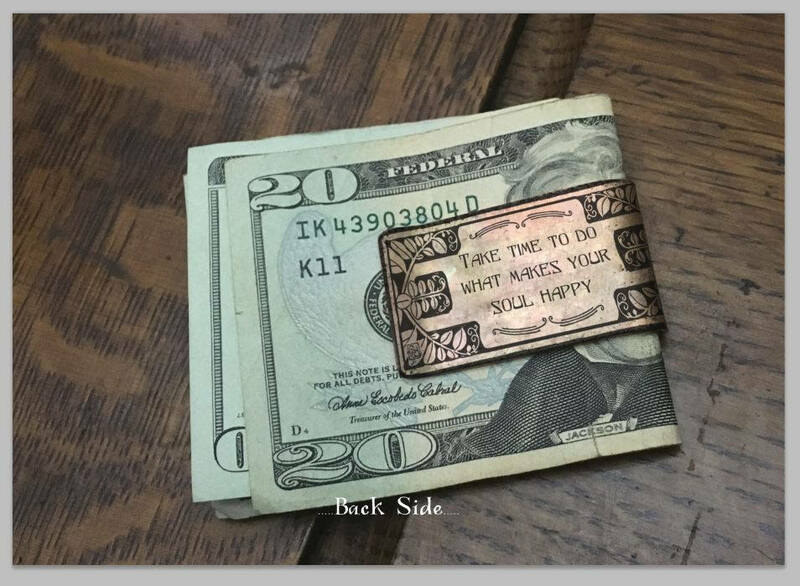 **Note: If a different design is required or you have a design that you would prefer on the money clip please contact me via convo on Etsy.